Seven persons were injured, four of them seriously, when a gang of about 15 robbers, armed with blunt weapons and carrying toy guns, struck at two houses in Prem Vihar, near the Tibba road, just after midnight last. The robbers decamped with nearly Rs 50,000 in cash and 22 tolas of gold jewellery apart from other valuables. Some of the loyalists of the Chief Minister, Capt Amarinder Singh, in Ludhiana are learnt to be actively working to win over some of the dissidents back to the CM's camp. Roadside encroachments in the city remained on the rise this year, frequent drives by the authorities against these notwithstanding. Encroachment on vacant public land in the Focal Point area and the space along almost all roads in the old city took place at an alarming rate this year. New Year hardly brings anything new for them. They have well adjusted with the environment now and feel that celebrations are meant for people who have done something good in the past. For them, who are abandoned by their loved ones, life means passing the time. The Village Life Improvement Foundation, Brahampur, near here, has started development works with funds received from the Canadian International Development Agency (CIDA), British Columbia, while a matching grant from the state government is still awaited. It was a year of unfulfilled promises for the Ludhiana district as most of the schemes announced by the district administration with much hype could not see the light of the day. During most part of the year, the residents saw the spread of various diseases that took many lives. IF one looks at the visit of Mr George Fernandes to Leh, Kargil and Siachen with 4.5 tonne of plum cake for the troops on Christmas, it was, no doubt, a good gesture. But then, the Defence Minister should have known that the Indian troops are not fond of cakes. Having been a Defence Minister for several years, Mr Fernandes should have also known by now that soldiering is poles apart from politics and trade unionism. The best way to win them over is by giving the soldiers their long-denied due. The Guards Regimental Centre band that won the Southern Command band competition. For the city 2003 did not have much to remember or regret. But there were certainly some defining moments in the contemporary history of the city. It was on September 4, 2003, that President, Dr A.P.J. Abdul Kalam visited the city. 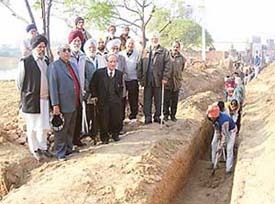 It was after over three decades that the President of the Republic visited Ludhiana. Given his popularity across the country that cuts across all sections of society, it was really a memorable moment for the people of Ludhiana. 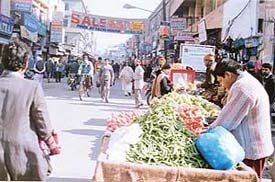 Even after one month of the Punjab and Haryana High Court's directions to the Municipal Corporation to clear encroachments on municipal and government land in the city within two months, the MC administration and the political leadership is yet to draw up an action plan to go about the task of clearing more than 9000 encroachments on public roads and street, parks, pavements in the residential and commercial areas. At a meeting here yesterday, pensioners belonging to the Government Pensioners' Association ( registered) discussed various problems confronting them. They flayed the Punjab Congress government for its anti-pensioner decisions. They regretted that during its 22-month- long rule and after having presented two Budgets, the Amainder Singh regime had not implemented even a single promise made to them. Modern projects, especially of software, are subject to technical complexity and require diversity of skills. To deliberate upon the increasing role of management in this field, the local Guru Nanak Institute of Management and Technology (GNIMT), Gujar Khan Campus, Model Town, organised a seminar on "Software Project Management". One person was killed and another injured when a bus ran over a motorcycle here today. The Raekot police has busted an inter-state gang involved in bank dacoity and stealing vehicles. Its kingpin, Pargat Singh Rajasthani, who was wanted in Punjab as well as Haryana in more than six cases, has been arrested. A car and two motorcycles have been recovered from him. 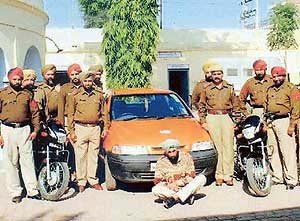 Pargat Singh Rajasthani (sitting), who has been arrested by the Raekot police for alleged involvement in bank dacoity and stealing vehicles. Gurjit Singh, a resident of Dehlon, was arrested from near the Canal bridge near Gill village yesterday by the police and 340 pirated CDs of Hindi films and 60 CDs of pornographic stuff were allegedly seized. "We do not want to go back. In spite of the cold weather, the hospitality offered by the host college - Master Tara Singh Memorial College, and other Punjabis, have made us love Punjabis. We think we are going to do nothing during the way and back home, but rave about our days spent in Ludhiana," was the refrain of almost the 200 students who had come to attend the National Integration Camp organised by the Ministry of Youth Affairs and Sports. The camp had begun on December 21 and ended on December27. A 10- day NSS camp organised at Senior Secondary School, Threekay, by Directorate of Youth Services, Ludhiana, ended on December 28. As many as 250 NSS volunteers from different school from Ludhiana district participated in the camp. In a novel way of service to the humanity and service to the community, the Punjab Cultural Promotion Council distributed pullovers among 120 poor-students of Government Primary School Jawaddi as part of the New Year celebrations here today. Dayanand Medical College and Hospital authorities have claimed that the controversy surrounding the death of an infant at the hospital was unjustified and the family was levelling false allegations. Cremica organised a health awareness quiz for students of Kendriya Vidyalaya in Baddowal in association with Hero DMC Heart Institute. The quiz was for the students of class V onwards. The questions were asked on topics like health, food, hygiene and balanced diet. There were exciting rounds like health in your hands, buzzer round, puzzle round fast forward round and bonus round.